← In Honor of Yom Kippur, here are the Dead Sea Scrolls. I’ve had this doll for a while. Looks so innocuous, doesn’t it? 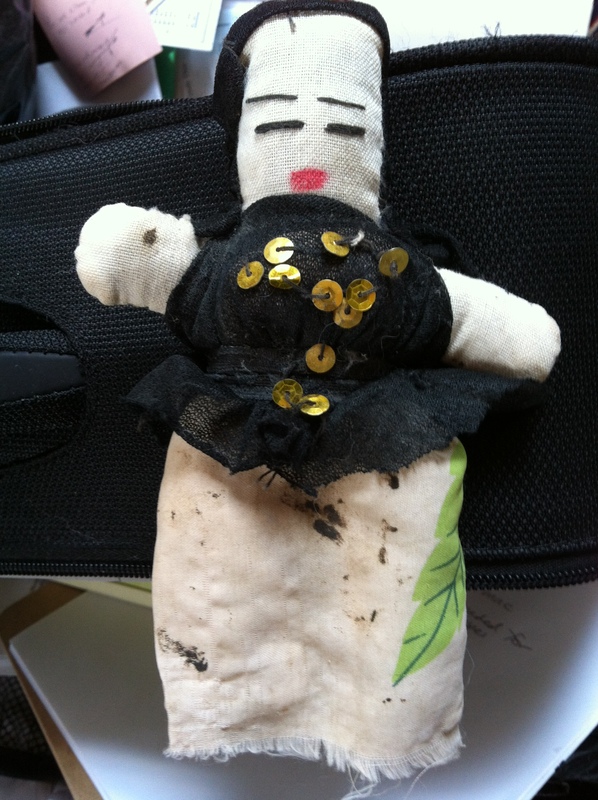 A client (I don’t remember who) told me that she (I think it was a she) had been given the doll for good luck a while back. She thought it was Egyptian. She didn’t want it anymore, but had been reluctant to get rid of it, thinking that doing so might bring her bad luck. I declared that “a bunch of malarkey” and encouraged her to donate it if she didn’t enjoy owning it. So then I had it in my possession. I was curious to see what the story might be behind the doll, because I like magic, folklore, and stuff like that. So I hung onto it while I did some online research, but I couldn’t turn up anything. Then I thought I’d post it here and see if anyone knew anything about it. But of course that didn’t happen right away. The next time I looked through my weird stuff photos for what to post next, I decided that the doll wasn’t that weird or interesting after all, and that I should just send it off to donation. But then I thought about the good fortune I’d had recently. Business was booming, my health was good, everything was great. It couldn’t possibly have anything to do with the doll…? Of course not. But what if it did? And so my decision-making process just stalled out like an old car. And the doll sat there for months. Well, business has slowed down and I’m not feeling so well, so I guess it’s time for the doll to move on. I’m still feeling a little unsure about ditching it, but I have to walk the walk, for my clients’ sake! This entry was posted in Charms, Dolls, Toys and tagged cloth, doll, Egyptian, good luck, toy. Bookmark the permalink.